Iwill is a company that has always targeted the enthusiast community. They were the first to introduce DDR333 and 2/5 and 1/5 AGP, PCI dividers to the AMD users. 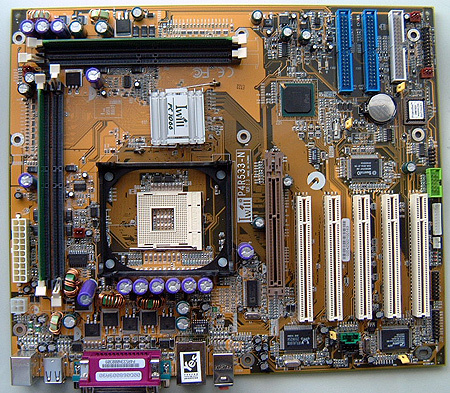 They're a company that actually listens to its audience as is evident with their XP333-R motherboard. With the P4R533-N, Iwill is again trying to target the extreme performance enthusiast. The Iwill P4R533-N is based on the Intel i850E chipset which combined with the 82801 ICH2 southbridge offers host bus, memory and I/O interfaces capable of running on either 400MHz or 533MHz front side bus speeds. The dual FSB support means that older socket 478 Pentium 4 processors on the Williamette and newer Northwood "A" cores will run continue to run at a 400MHz FSB. If you are lucky enough to have a Northwood "B" Pentium 4 it will run with a 533MHz FSB - improving peak bandwidth up to a potential 4.2GB/s. The i850E chipset supports dual channels of both PC800 and PC1066 RDRAM giving the user a chance to move from 3.2GB/s peak bus bandwidth to 4.2GB/s - that's fast! You can't mix and match RDRAM types of course, and the same rules hold true. 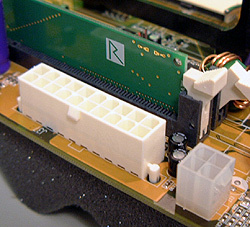 RDRAM modules must be used in identical pairs and inserted into the right sets of RIMM slots. The P4R533 will support up to 2GB of RDRAM memory, which should be more than enough for most people. The four layer Iwill P4R533-N is a fairly feature packed slab of PCB, coming with on board 10/100 LAN, five 32-bit PCI slots, a 4X 1.5V AGP slot, four fan headers, a memory stick reader port, smart card reader port, IrDA/WOL/AUX audio-CD, and four USB 1.1 ports. If the board had support for USB2.0 as well there really wouldn't be anything lacking (it would need to use the IHC4 for that). On board audio comes to us by the C-Media CMI8738/PCI-6ch-MX chipset. This hardware audio solution brings upwards of 6 channels of audio to the P4R533, though an optional SPDIF module is required to take full advantage. The benefit of the C-Media solution over that of AC'97 codec is that sound is hardware, not software based. AC'97 has progressed far from where it first began, but can still cause an increased CPU load during use. When we first look at the motherboard it looks a little odd with the perpendicular RIMM slots. The generally layout is actually very close to that of Asus's P4T line of motherboards. The position of the ATX and P4 power connectors at the top of the motherboard is good as they are not going to get in the way of anything. Five 32 bit PCI slots ensures easy upgradeability should you need the extra room. In general I have never liked onboard audio, but if more manufacturers were like Iwill I would be happier. In all the motherboards I've tested from them, they've always used higher quality hardware based C-Media soundcards rather then the CPU sapping AC'97 codec. Good job Iwill, it's the little things that count! While this is not the fault of Iwill, the AGP slot can only use 4x cards that run at 1.5V. Users of older videoocards will need to upgrade that as well if their going to be buying an Intel chipset based P4 motherboard. Probably the biggest knock we have with the motherboard is it doesn't have USB 2.0. We're not really sure why Iwill has gone with the older ICH2 southbridge instead of the newer ICH4. I'm sure you're all sick of hearing this from me, but the placement of the IDE and floppy drive connectors could impair the use of longer/full length PCI cards in slots 3-5.